Data is defined as “facts and statistics collected together for reference or analysis.” But what happens if the data you reference is skewed or inflated? With bad data come bad business decisions. Since data is used to predict, handle and enhance the interaction between a business and a consumer, there can be devastating effects caused by inaccurate data. Despite persistent efforts to point the finger of blame at external sources, bad data often comes from errors within the data collection processes. Frequent visitors to your site can artificially inflate your data, specifically your “visit” and “pageview” counts. For example, company employees who constantly visit your site can skew the perception of how your target audience actually interacts with your site. During your Adobe Analytics Audit, be sure to update IP address settings to ensure the exclusion of appropriate traffic, and accurate data projections. It may seem too obvious, but this is a simple step that is often missed and can easily inflate your data. When imported into Adobe Analytics, data from Google AdWords can be valuable in showing what portion of your website traffic and goal completions are driven by AdWords. Make sure your accounts are set up correctly and have an active administrator to manage them. External data imported into Adobe Analytics through Data Sources or Data Connectors requires a record key if you need to tie the external data with the analytics data. This data could come from an AdWords account, CheetahMail integration, or a call center log. Often the transactionID variable is the common key. There is no report in Adobe Analytics that shows data captured in transactionID; it can only be accessed in the Data Warehouse. For example, a transactionID might be used to link online sales with offline returns, or online lead forms with follow-up calls. Use your governance plan to identify when transactionIDs should be captured and where the data comes from. Then build a business rule in your audits to verify that it is populating correctly. Page names are crucial to the organic search success of your website, so it’s important they stay relevant and accurate. Some analytics vendors recommend using the Page Title tag on each page to populate the Page Name variable. However, this is a risky move for data quality because a Page Title tag might change, and is often bloated with other words for search engine optimization. Adobe Analytics reports cannot combine old and new names into the same report, so every page needs an unchanging, unique name under 100 bytes in length. This compliance coincides with typical vendor standards. Various strategies can be used for a good page naming scheme, but it is smart to consult with the stakeholders before getting it set in stone. In order to understand the success level of your website, you must take the time to measure internal search during your Adobe Analytics audit. One particular aspect of importance is evaluating where visitors search, what they search for, and the quality of the provided search results. Internal search should record the actual search terms, the entire phrase, and the number of search results returned. Most companies use both props and eVars for search terms so they can do pathing (s.props) and success attribution (eVars). However, many websites slip up by recording the search term on every page of the search results, which inflates the number of times search terms are counted. It’s important to understand the effectiveness of your internal search because visitors who search internally convert at a much higher rate. An audit of your search tool can show where the search terms are being set and if they are being accurately recorded. Staying on top of these seemingly simple, yet crucial, tasks will help keep your internal data trustworthy. 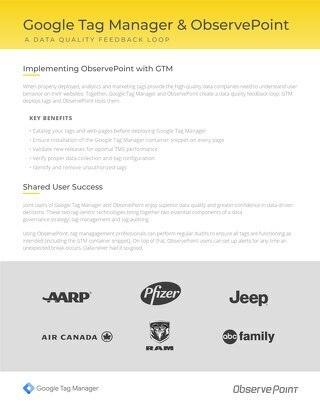 While each of these points are crucial, they aren’t the only things keeping your data clean and clear—automated validation services, like ObservePoint offers, can also ensure the accuracy of your data while saving you time and resources that are better spent analyzing your data rather than cleansing it. 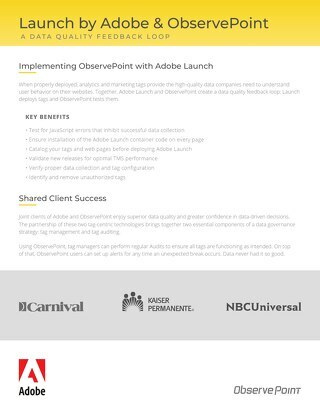 To learn more about these, and other useful tips, check out this free 21 Point Adobe Analytics Audit eBook, or take advantage of ObservePoint’s free website audit to get you started.